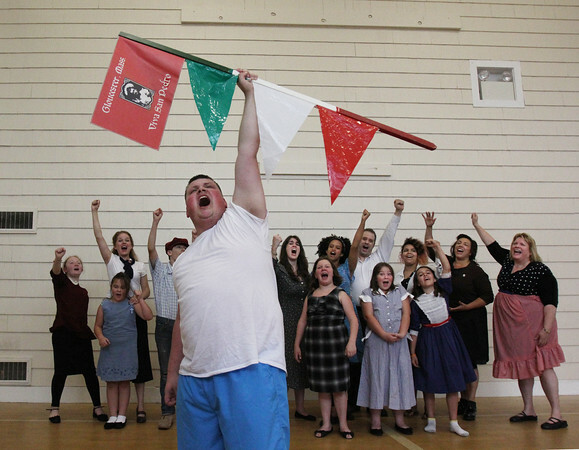 Caleb Wnorowski leads the cast in the conclusion of "Greasy Pole: The Musical," during rehearsal last week in Gloucester. The show, presented by Henry Allen's North Shore Folklore Theatre Company, will be presented through June 28 the Magnolia Library center, with showtimes Friday and Saturday at 7 p.m. and Sundays at 2 p.m. There will be an additional show Sunday, June 28, at 8 p.m.